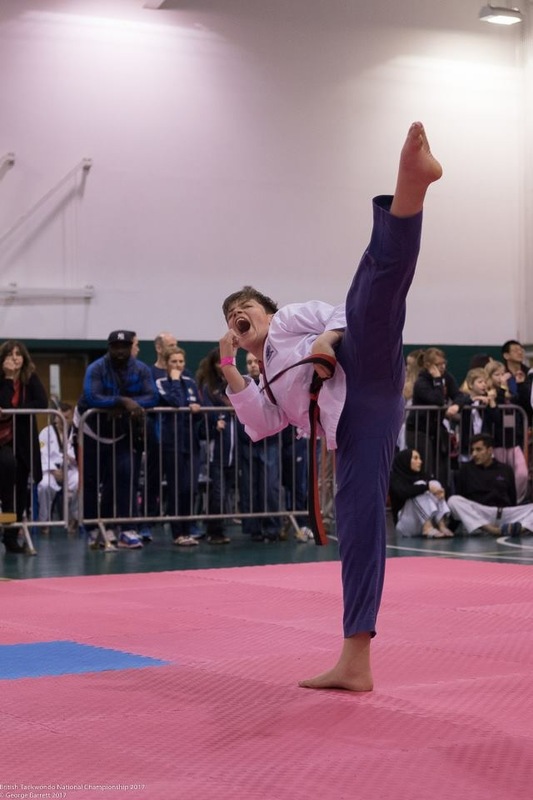 This week’s Taekwondo Stories was sent to us by Lisa Brockies who wanted to tell us about her Autistic son Bradley and his fantastic Para-Poomsae Taekwondo journey. Bradley started Taekwondo in December 2012, aged 8. We had been watching the film Karate Kid and Bradley announced that he would like to have a go at something like that. His friend from school had recently joined an ITF club, so Bradley went along too. We had some long chats with the Instructor as Bradley has Autism and severe anxiety, to the point this could be very restrictive for him. Initially, they were very understanding and supportive of Bradley but this changed over time and we left the club in December 2013. Bradley did not want to give up Taekwondo. 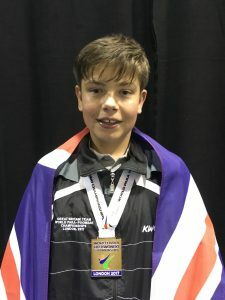 After searching the internet, we found the name of a local British Taekwondo club, so we called explaining the difficulties Bradley has and how he had been treated at his previous club. The Instructor, Ryan Cousins of Yong Gi Taekwondo, was very understanding and suggested we pop along to a class to see how Bradley felt. That first class Bradley had one-to-one coaching for two reasons, one so that Mr Cousins could establish how different Bradley’s training at an ITF club was, and two to see how he and Bradley responded to each other and how Bradley would feel about going there. This proved to be the best thing that could have happened to him. The club was very welcoming to all of us, and before long our whole family had taken up Taekwondo. Bradley was still highly anxious and only communicated with a few but none the less this was progress. Some classes he coped well, other times he struggled. Bradley wanted to try to compete in Poomsae. After watching Bradley at a grading, it was suggested by Master Sumner that Bradley may be able to compete in a Para category for Intellectual Impairment, making it possible for him to access competitions. Bradley competed in his first competition at the National Taekwondo Championships on 1st March 2015 as a blue belt. We were contacted later that evening by Bradley’s Instructor who had been approached with an invite for Bradley to join the National Poomsae squad. He had his first squad training session on 19th April 2015. These sessions were difficult for Bradley due to the number of people, acoustics in the training hall and a few other issues and although he was determined to keep going, he could often be found in the corner quite distressed. There was good understanding given and apart from stares from some of the younger squad members Bradley was made welcome. At the end of 2016 the way the Para’s were coached changed. Bradley was introduced to Russell Watkinson and Ian Murphy who were going to train the Para-athletes. They were trained in a smaller group, sometimes even in a different room to the rest of the squad. This was when Bradley started coming into his own. He could cope better with the sessions, which were fewer in numbers and quieter. Bradley has always been better at learning on a one-to-one level as we have found in his schooling. He is a very visual learner and is always better when shown. He started becoming more confident in himself and more confident in his ability in Taekwondo. Bradley successfully graded for his black belt at a British Taekwondo Dan grading in November 2016. Bradley got his full classification from INAS for the P20 Intellectual Impairment category in February 2017. With Master Gemma Biescas, Russell Watkinson and Terry Cooper coaching him, he has gone on to represent Great Britain twice, becoming World Para Champion P20 Junior Male 2017, and European Para Champion P20 Junior Male 2017. He has just been reselected for the 2018 British Taekwondo GB National Para-Poomsae squad. Bradley would not be where he is now without the support and encouragement from his coaches. We cannot thank Ryan Cousins enough for everything he has done to support Bradley, and also the British Taekwondo squad coaches that have also trained and supported Bradley on his Taekwondo journey over the last five years.